Stay on fish once you find them. Once you have found a school of active fish stay on them. Many a time I see anglers trolling a shoreline from end to end. Each time they connect with a fish, they keep on trolling in the same direction until the pass is complete and then turn to go back and do it again. Upon catching fish on a troll I always do a tight turn and head back through the area I just hooked a fish in. I know there are fish there. Why would I ignore that? If the area is small, I may switch techniques to accommodate a more productive technique. Sometimes the school you were successfully fishing over has moved either up or down the water column or along it at the same depth. I keep in touch with these fish by staying in tune with where I caught my last fish and sliding along with them. In a tournament one time, there were a bunch of anchored boats along a two mile long drop off. 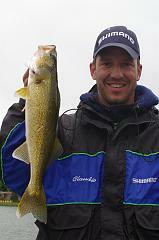 I maintained contact with a big pod of walleye as they slowly cruised the breakline. I made multiple passes through the same section of the break; turning back through the fish once I hadn’t hooked any for a few minutes. Many of the anchored would only contact those fish that passed by their location.